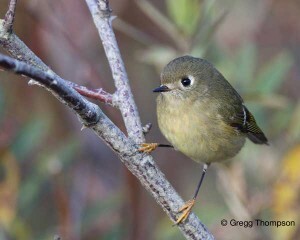 [Ruby-crowned Kinglets are among avifauna’s tiniest gladiators.] That’s why they’re called kinglets: supposedly, they all think they deserve to be king of the hill, and they don’t care who knows it. Usually, they establish dominance by parting the olive-green feathers on the tops of their heads and raising the fire-red feathers that lie underneath. Then they shine their heads at each other. But in early spring, they go farther than mere head-shining. They actually go after each other. One kinglet has been particularly feisty this season. He’s set up temporary housekeeping on a rosebush in the South Blue Forest. Here he takes on all comers. Sometimes his challengers are other kinglets looking for a fight. But his greatest rival is an Anna’s Hummingbird with big ideas, who has laid claim to the entire area west of the forest. I love that little guy because he shows me what it takes to stay engaged in life, to feel the renaissance of spring no matter your birth date. [My birth date occurred long ago, but like the kinglet,] I too am still in the ring. Still taking punches. Still ahead on points. In the early morning of the summer, before the sun climbs high, the stillness of the night air lingers into the day. No leaf stirs, not even the wiggly leaves of the cottonwood trees that are tied so loosely to their branches that they swivel at the slightest breath of a breeze. On such mornings, I hurry down to Main Pond to set up my camp stool and wait for the Barn Swallows to come for their morning drink of water. Barn Swallows like to do everything on the fly, and drinking is no exception. By the dozen, they swarm down to Main Pond from their nests under the eaves of the old crewhouse to the south. 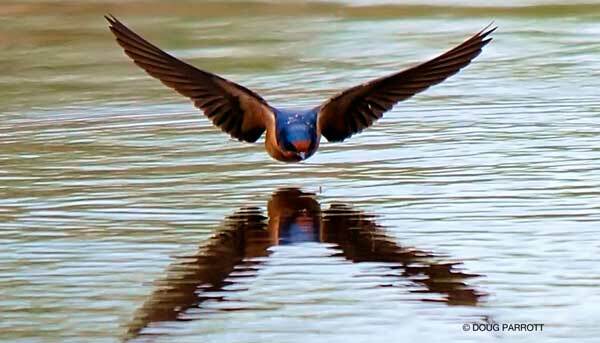 Each swallow files its own flight plan, and then they swoop over the water in all directions, never colliding. As each bird nears the surface, it dips its head to skim a few droplets of water with its bill. The mirror of the water becomes etched with a perfect vee when the swallow finishes its drink and lifts itself back into the sky. But that is not all the bird leaves behind. As each swallow swoops low over the water, the wind from its wings presses ripples into the smooth, shining pond. The ripples spread out a short distance and then disappear, too fine to last for long, too beautiful to stay for long, too magical for me ever to forget. In the stillness, in the solitude, with only these wild creatures and me moving on the stage of life, it is like watching a kabuki play. Perfection. Like fog caressing moss, like smoke wafting over trees, the Barred Owl floated noiselessly to her favorite perch in the swamp: a cottonwood nook hidden from the prying eyes of her enemies, the crows. Wrapping her needle-sharp talons around a branch, the owl folded her enormous wings along her back and blinked sleepy eyes. Dawn was just breaking. The sun’s corona nibbled at the houses lining the ridge top to the east. It had been a good night of hunting: one unwary rat and a tasty vole, enough to keep the owl satisfied until the moon rose again. She puffed out all her feathers and shook them a little, like a woman putting her curls into order. She would do a full preen when she awoke again at dusk. For now, she was tired. It was time to rest. Her eyes slowly closed. 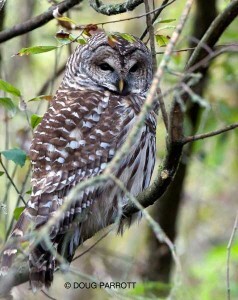 For the first time in history, Barred Owls have come to Montlake Fill.